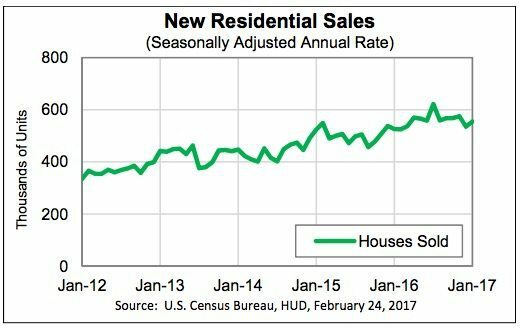 Sales of new single-family houses in January 2017 were at a seasonally adjusted annual rate of 555,000, 3.7 percent above the revised December rate of 535,000 and 5.5 percent above the January 2016 estimate of 526,000. The median sales price of new houses sold in January 2017 was $312,900. The average sales price was $360,900. The seasonally adjusted estimate of new houses for sale at the end of January was 265,000. This represents a supply of 5.7 months at the current sales rate. The frequency of defects, fraudulence and misrepresentation in the information submitted in mortgage loan applications increased 5.8 percent in January 2017 over December 2016. Compared to January 2016, the Defect Index decreased by 3.9 percent. The Defect Index is down 28.4 percent from the high point of risk in October 2013. 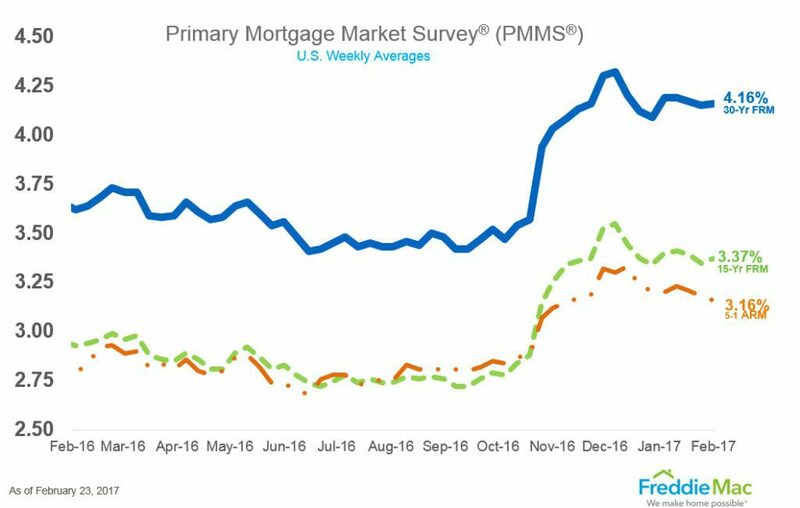 The 30-year fixed-rate mortgage (FRM) averaged 4.16 percent with an average 0.5 point for the week ending Feb. 23, 2017. This is up from last week when it averaged 4.15 percent. A year ago at this time, the 30-year FRM averaged 3.62 percent. U.S. house prices rose 1.5 percent in Q4 2016 from Q3 2016. House prices rose 6.2 percent year-over-year in Q4 2016. FHFA’s seasonally adjusted monthly index for December was up 0.4 percent from November.